Lady Margaret Douglas was the daughter of Archibald Douglas, 6th Earl of Angus, and Margaret Tudor, Dowager Queen of Scotland and the sister of King Henry VIII and was born on 8 October 1515 at Harbottle Castle in Northumberland. 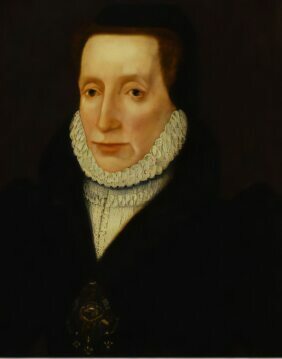 At the time of Margaret's birth, her father was facing difficulties in Scotland and her mother, Queen Margaret was involved in a power struggle for the regency of her young son King James V of Scotland, had sought refuge in her native England. The marriage of Margaret's parents was not a happy one and the couple separated. When she was aged three, her father her into his care, Although he employed a governess, Margaret did not receive a good education. In 1522, the Earl of Angus visited France and may have taken her with him. Margaret did not see her mother from 1521 to 1524 and was highly influenced by her father. Margaret's parents unhappy marriage was finally annulled in 1527. In the October of 1528, the Earl of Angus was threatened by Margaret's half brother, King James V of Scotland (the only surviving child of Margaret Tudor's previous marraiage to James IV) and sent the thirteen year old Margaret back across the border to stay at Norham Castle in Northumberland. Her mother made an attempt at this time to obtain custody but was unsuccessful. Henry VIII, who strongly disapproved of his sister's behavior, did not wish for Margaret to be influenced by her, Margaret was made the legal ward of her uncle. After briefly staying at Berwick Castle, Margaret joined the household of her godfather, Cardinal Wolsey. When Wolsey died in 1530, Lady Margaret was invited to court, Henry VIII ordered a dress from his Great Wardrobe for his neice Lady Margaret, to welcome her. She stayed at the royal Palace of Beaulieu, where she lived in the household of her cousin, the future Mary I, with whom she shared her education and was to form a life long friendship with. Margaret was appointed as a lady-in-waiting to Henry VIII's second wife Anne Boleyn and caught the eye of Anne's uncle, Lord Thomas Howard. Thomas was a younger son of Thomas Howard, 2nd Duke of Norfolk. By the end of 1535 Thomas and Margaret had formed an attachment and were secretly engaged. Her uncle Henry VIII learned in early July 1536 of Margaret's engagement he rected in characteristic fury. Henry had by this time, declared his two daughters, Mary and Elizabeth, illegitimate, which left Margaret next in the line of succession to the throne, for her to contract an unauthorized marriage was politically outrageous, especially with the son of a powerful nobleman and near kin of the now disgraced queen. Both Lord Thomas and Lady Margaret were sent to the Tower. On 18 July 1536, Thomas Howard was condemned to death but was spared execution, he remained in the Tower even after Margaret broke off their relationship and died there on 31 October 1537. Probably due to stress, Margaret fell ill in the Tower, and Henry, relenting a little, allowed her to move to Syon Abbey under the supervision of the abbess. She was released from imprisonment on 29 October 1537. Margaret was again in disfavour in 1540, when she indulged in an affair with Sir Charles Howard, the son of Thomas' elder half-brother Lord Edmund Howard, and the brother of Henry VIII's fifth wife, Catherine Howard. In 1543, Margaret was one of the few witnesses of King Henry's final marriage to Catherine Parr, Dowager Lady Latimer, at Hampton Court. Margaret became one of Queen Catherine's chief ladies. 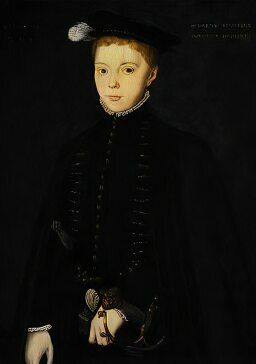 (ii)Charles Stuart, Earl of Lennox (1555-1576) who married Elizabeth Cavendish and became the father of Lady Arbella Stuart. During the reign of her cousin, Mary I's, Margaret, now known as Lady Lennox had rooms in Westminster Palace. In November 1553, the Queen told the ambassador Simon Renard that Lady Lennox was best suited to succeed her to the throne. On the accession of Queen Elizabeth I, Lady Lennox moved to Yorkshire, where her home at Temple Newsam became a centre for Roman Catholic intrigue. Her eldest son, Henry Stuart, Lord Darnley married his cousin Mary, Queen of Scots, thereby combining their claims to the throne of England, as a result the furious Queen Elizabeth I sent Margaret to the Tower as punishment for her part in the arrangement. Mary Queen of Scots gave birth to a child by Darnley on June 19, 1566 and named James. After Lord Darnley was murdered in 1567 she was released. Margaret at first denounced her daughter-in-law and neice Mary for her part in the murder of her son, but eventually came to be reconciled with her. Her husband assumed the government of Scotland as regent for their young grandson, James VI. The Earl of Lennox was assasinated in 1571, shot in the back in a skirmish at Stirling Castle. The Lennox Jewel, otherwise known as the Darnley Locket, a heart shaped locket set with precious stones, gold, enamel, Burmese rubies, Indian emerald and cobalt-blue glass was made in 1570 for Lady Margaret commemorate her husband. 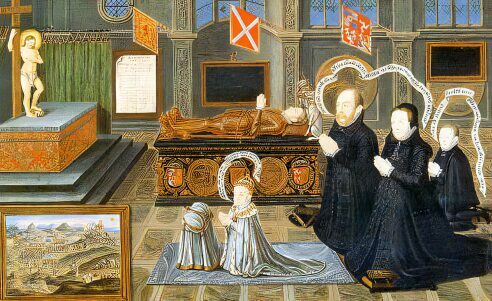 The jewel reveals the couple's ambitions for their grandson, the future James VI and I. The Lennox Jewel was formerly in the collection of art historian and antiquarian, Horace Walpole, but was purchased by Queen Victoria in 1842. The jewel is now on display to the public at Holyrood House in Edinburgh. In 1574 she again aroused Elizabeth's displeasure by arranging the marriage of her younger son, Charles, to Elizabeth Cavendish, the daughter of the wealthy and formidable Elizabeth, Countess of Shrewsbury, otherwise known as Bess of Hardwick. Lady Lennox was sent was sent to the Tower again, but was pardoned after her son's death in 1576. Margaret took great interest in her grandchildren, James and Arabella, becoming a devoted and affectionate grandmother. The health of her remaining son, Charles Stuart was a source of worry to Margaret. He often spat blood and his cheeks, at times, carried the high flush of the consumptive. After Charles' death, she helped care for his daughter, Lady Arbella Stuart, but did not survive him by very long. A few days before her death at the ageof 52 in March, 1578, she dined with Elizabeth's favourite, Robert Dudley, Earl of Leicester, which led to rumours that she had been poisoned although there is no evidence for this. In her will of 1578 she still remembered her uncle Henry VIII fondly, listing a picture of Henry among her treasured possessions. Although she died deeply in debt, Margaret was provided with a grand funeral in Westminster Abbey, at the expense of her cousin Queen Elizabeth I. She was buried with her son Charles in the south aisle of Henry VII's chapel in the Abbey. Her recumbent effigy, made of alabaster, wears a French cap and ruff with a red fur-lined cloak, over a dress of blue and gold. On either side of the tomb chest are weepers of her four sons and four daughters.